Thankfully baculoviruses don’t go through a rebellious teenage phase. They do however have a well-defined 2 step life cycle. Here we will cover the life cycle in the natural insect host and the implications this has on use in insect cell culture. 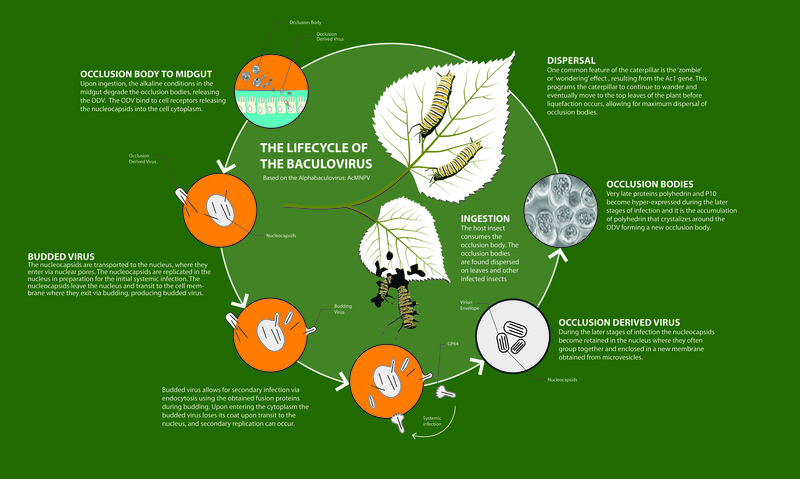 Oxford Expression Technologies is grateful to Leo Graves (Oxford Brookes University) for kindly provided this picture, which neatly illustrates the life cycle of the baculovirus. We’ll focus again on Autographa californica multicapsid nucleopolyhedrovirus (AcMNPV) as this is widely the most well studied baculovirus. AcMNPV has a bi-phasic life cycle resulting in the production of 2 forms of virus, budded virus (BV) and occlusion-derived virus (ODV). The occlusion-derived virus is responsible for the primary infection of the host insect while budded virus is released from the host cells for cell to cell infection. BVs contain a single rod shaped nucleocapsid enclosed by an envelope containing the membrane fusion protein GP64. This GP64 is added to the envelope when the nucleocapsid buds through the host cell plasma membrane1. The BV from of the virus is 1000-times more infectious for cultured cells2 compared to the ODV form and is responsible for cell-to-cell transmission3. It is the BV form of the virus that delivers foreign genes into the host insect cell. The baculovirus infection can be split into 3 phases, early (0-6 hours post infection), late (6-24 hpi) and very late phase (18-24 to 72 hpi). In the late stages of infection large numbers of occlusion bodies (OB) or polyhedra are formed. These are made up of multiple rod shaped nucleocapsid enclosed by an envelope acquired new from the nucleus. The nucleocapsids are then embedded in the stable crystalline matrix of the polyhedra. These polyhedra are mainly made from polyhedrin4, 5, a protein that is produced by the very powerful transcriptional activity of the polyhedrin gene (polh) promoter6. The occlusion bodies produced protects the virus and allows survival between hosts. It is worth mentioning that most baculovirus expression vectors, such as flashBAC™, do not produce polyhedra, just the budded form of the virus. This acts as a useful safety feature because the recombinant virus produced can’t survive out in the natural environment without the polyhedra. Now we have covered the major players in the baculovirus life cycle let’s take a look at an example of infection in the natural environment. Normally the infection occurs when a host insect feeds on plants that have been contaminated with occlusion bodies / polyhedra. Once eaten the polyhedra matrix dissolves in the alkaline environment in the insect midgut, effectively its stomach. This releases occlusion derived virus (ODV) which bind to the epithelial cells of the midgut releasing nucleocapsids into the cell cytoplasm. Once inside, the nucleocapsids are transported to the nucleus where they are replicated in preparation to form budded virus. The BV initiates the secondary infection spreading systematically through the cells. In the later stages of the infection the occlusion derived form of the virus is produced. The occlusion bodies are released when the cells lyse. The lysis caused by the infection is extensive effectively causing the host insect to melt. Now here’s the scary part, one common feature of baculovirus infection is to cause a “zombie effect” in the host insect. This causes the insect to wander up the plant before lysis to maximise dispersal of the virus ready to be eaten by another unsuspecting insect. 1. Blissard, G. W., and Wenz, J. R. (1992). Baculovirus GP64 envelope glycoprotein is sufficient to mediate pH-dependent membrane fusion. J Virol. 66, 6829-6855. 3. Monsma, S. A., Oomens, A. G. P., and Blissard, G. W. (1996). The GP64 envelope fusion protein is an essential baculovirus protein required for cell-to-cell transmission of infection. J Virol. 70, 4607-4616. 4. Summers, M. D., and Smith, G. E. (1978). Baculovirus structural polypeptides. Virology 83, 390-402. 5. Rohrmann, G. F. (1986). Polyhedrin structure. J Gen Virol. 67, 1499-1513. ← First Things First: What Exactly Is A Baculovirus?